Small body-Big power,this super cool LED bicycle lights can be equipped most bicycles,like mountain bikes,ross bikes,mummers and child bicycles all.From 12″ toddler bikes all the way up to 29″ adult bicycles.High quality wire with insulating paint coating,long-lasting and safe to use.Wonderful festival gifts for both boys and girls,bring lots of fun for everyone.Let the lantern create your world,everyday life in the fairy tale story. 1 installing instruction(back of packing)Ultra Bright LED-6.3ft long with 20 pcs high quality leds,High brightness lights gain increased visibility from all directions, keep your loved one or friends safe in low light conditions. Super Cool At Night-Different from other normal bike lights,with this lights,your bike will STAND OUT from all angles, whether you are moving or not. Turn Switch to “flashing” mode make you get more attention from buddy.Awesome gifts for both boys and girls,bring lots of fun for every rider. Safe for Kids-2 AA Batteries required for each tire.High quality wire with insulating paint coating,it’s touchable and safe to children. Easily Installing-You got it! 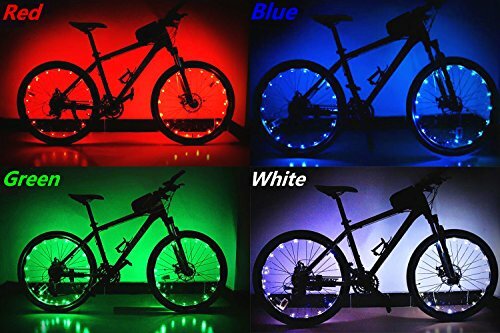 These super cool LED bicycle lights fit most size(from 12 inch to 29 inch) bikes.It’s easy to install following the instruction(back of packing) in a few minutes with a screwdriver.Turn on the lights and enjoy it. 100% Satisfaction Guarantee- We’re a lways here to help you with your order of brilliant products and customer services. If you have any issues after receiving the items, don’t worry, please feel free to contact the seller directly in your order, and we will solve your problems as soon as possible.